Create Embellish Adore: Whooooooooooooooo's birthday? Happy Birthday to YOU, Happy birthday to HOOO? I love March birthdays! The cards can be bright, fun, flowers, because it almost spring time!! 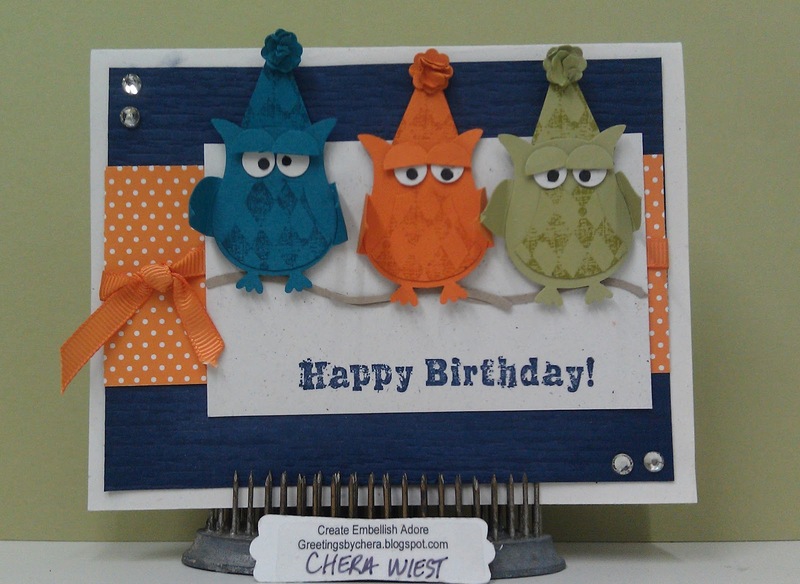 I love these little owls too - so that made this card even better! I love them even more since my own birthday is in March! I used the owl punch for my critters in Indigo, Pumpkin Pie & Lucky Limeade, punched Pennant & itty bitty for the party hats, 2 step bird for their arms & limb. I used the diamonds stamp from Grunge Rock on their hats and bodies. The Night of Navy is actually run thru the Big Shot, with woodgrain embossing, topped it with a piece of retired Tropical Oasis DSP, then tied grosgrain ribbon on. Added a few rhinstones and called it complete! Now its your turn! Get your birthday groove on and head to the Bloggers Challenge, you will have so much fun!! HAV A GREAT DAY! HUG THE ONES YOU LOVE!! THANKS FOR STOPPING IN! I love the owls and the colors you chose for this card, super cute! The owls are fantastic. Love the whole look. And by the way, Happy Birthday to you! Happy birthday to you too. I just had mine and I'm still celebrating with cards and goodies. Love your owls and I'll try my hand a making them too. Again, happy birthday. Those owls are adorable! Love your color combination, too. How fun is this!!! 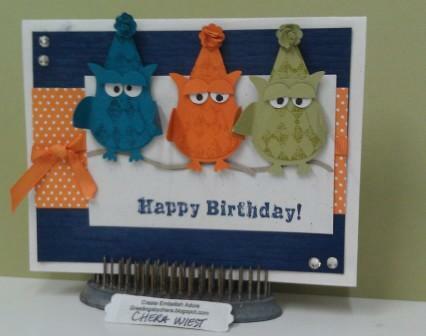 I love the owls in different colors- Happy Birthday! How cute - love those owls! Thanks for playing along with the Bloggers Challenge! This is just darling! So cute! Super Cute! - This is just a really fun card. - Happy Birthday! I'm a March B-Day gal too.